Needless to say, I have been traveling a lot this year! Santorini, Ischia, Munich, Venice, and Cappadocia, and that’s just since mid-September. Traveling can take its toll on your skin and hair, not to mention the difficulties of liquid and weight restrictions when packing. Fortunately, I have pretty much mastered my travel beauty routine and I thought I would share some of my favorite products and secrets. Facial Cleansing Cloths – I don’t necessarily use a particular brand (I really like Rodan and Fields back home, but I can’t get it abroad). I find that they all work basically the same. For travel, these are so handy, because they are your cleanser, eye makeup remover, and toner in one (and as an emergency airport shower when layovers get long). Moisturizer with SPF – When we travel, we don’t realize just how much more we are out doors and exposing our skin to the sun. I love Kiehl’s Ultra Facial Moisturizer with SPF 30. It’s lightweight (so no breakouts) while still providing ample moisture for my skin when traveling. Blow Pro Hair Powder – If my trip is shorter than 4 days, I won’t even bother bringing shampoo and conditioner, because this stuff is a life saver! Thanks to this miraculous powder I can go four days in between washes, which makes doing your hair while traveling so much easier and less time consuming (bye, bye blow dryer). Plus it is a powder so you don’t have to worry about liquid restrictions. The Blow Pro shower cap is also amazing. It keeps your hair perfectly dry and frizz free while you shower. Amika Dual Voltage Curling Wand – This curling wand is magic. I don’t know how it does it, but it creates curls that last for 3 days! Now everyone’s hair is different, but for me this wand has been my travel must-have all year. I take the time to curl my hair prior to departure, that way I have tighter curls for the first day of travel, looser curls the second day, and a soft wave the third day. All without having to re-style my hair! A Good Eye Cream – Your eyes are the first to start looking tired and haggard with travel. For this reason, I always invest in a good eye cream. I am currently loving Dr. Dennis Gross’s Ferulic + Retinol eye cream. The retinol stimulates the skin to regenerate more quickly, giving you a fresher and more youthful appearance. Chanel Les Beiges – This multi-action, all-in-one BB cream by Chanel is amazing. It keeps your skin looking hydrated and fresh with just enough coverage. Makeup Forever HD Powder – Since I take a ton of pictures (and my skin is super oily), I like to top my BB cream with this HD powder. I swear it makes my skin look super smooth and pore-free. And since it doesn’t have any pigments, you can reapply throughout the day. A Great Red Lip – I believe in the power of a red lip. Paired with over-sized sunnies, a great red lip will keep you looking chic and put together, even if you’re running on zero sleep thanks to a intense travel schedule or layovers. My current favorite is Nars’s Heatwave. 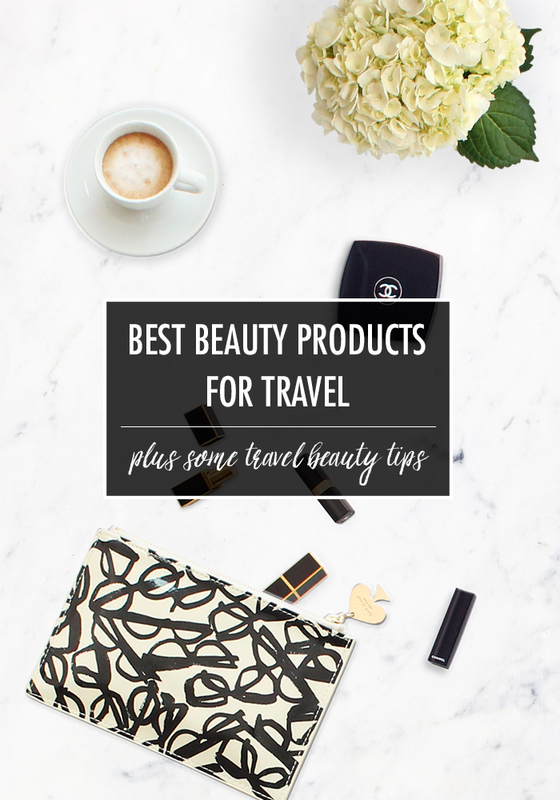 What are your favorite beauty products for travel?